CULLMAN – The United Way of Cullman County (UWCC) invited members of the community to “Get on the Bus” Wednesday and Thursday to show the impact the United Way’s partner agencies have on the community. Guests, along with UWCC Executive Director Sammie Danford, were given a guided tour of the different agencies. The Tribune rode along Thursday to visit the Good Samaritan Health Clinic, HOPE Horses, Inc., Cullman Caring for Kids and the Cullman County Center for Developmentally Disabled (CCCDD). The Cullman Area Rural Transportation Service (CARTS) bus loaded up at 8 a.m. and departed for the first stop, Good Samaritan Health Clinic. Jolanda Hutson, the clinicʼs executive director, explained the different departments and services that the clinic is able to provide through donations. Good Samaritan works to help adults between the ages of 19-65 who are without health insurance coverage. Good Samaritan has the same capabilities as most primary care clinics, It offers routine and chronic care, provides medications and referrals and is capable of assisting with dental, hearing and vision needs. The clinic does not duplicate any health care services that are offered for free elsewhere. Hutson also expressed her gratitude to Cullman Regional for its support. The clinic receives medications, equipment and other supplies through donations and from other long-term facilities. The tour then proceeded to HOPE Horses. 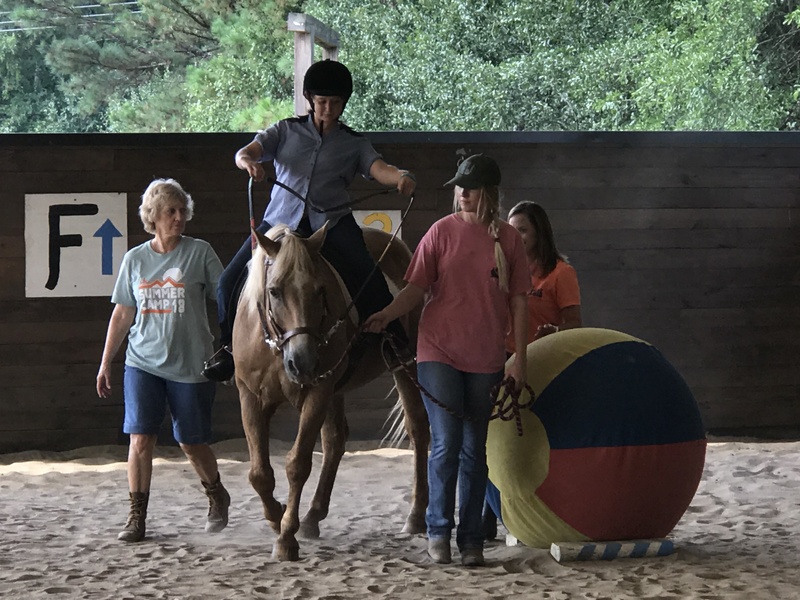 HOPE works with individuals with special physical, social, cognitive and emotional needs, using therapeutic horsemanship programs specifically designed to meet their needs. HOPE director, Kelsey Rice, introduced everyone to the program’s five unique horses. Each horse is a certified therapy horse, and each has its unique personality. Roxie, the only mare, is the queen of the barn. Prince is a 24-year-old quarter horse who was patiently waiting for his first lesson of the morning. Gus is the laidback funny guy who prefers the trails. Owen is the 1,800-pound spotted draft horse that passersby have confused as a cow. Teddy, who has been with HOPE the longest, is a draft/pony cross who is a tad bit shy at first. These beautiful horses are carefully managed to make sure they are exercised equally and regularly without overdoing it. Each student must fill out an application and present a physician statement. Students attend once a week for six weeks and are provided a CHA-certified instructor and two side walkers throughout the lessons. The instructors create lesson plans with games and fun objectives designed to help teach handling and riding skills. The HOPE campus consists of fun obstacles, five color-coded trails, a covered aren, and two outside arenas. The barn is a beautiful structure worth approximately $300,000 but built by donated labor from the Cullman community. Sarea, a student of HOPE, was beginning her lesson by tacking the horse (Prince) as all students are expected to do. The area was set up with a variety of obstacles and a giant colorful ball that would be incorporated into the lesson plan. Sarea was a vision of confidence as she led her horse throughout the arena. The next stop on the tour was Cullman Caring for Kids (CCK). Assistant Director, Nancy Bryant, explained the services the agency provides. CCKʼs mission is to end child abuse and make sure no child in our community is hungry. The food bank serves an average of 550 families a month. The food bank also works hard to provide baby food, diapers and other supplies to qualifying families. Food donations are always welcome, and the agency receives support from Publix and Wal-Mart. Monetary donations are encouraged as CCK can often purchase meats and other items for a lower price than the average consumer. Volunteers can also be trained to become a C.A.S.A. (Court Appointed Special Advocate). After completing a 30-hour training course, you can become a court appointed advocate and speak for the best interests of a child in court. If you would like to apply to become a childʼs advocate, applications are at the C.A.S.A. office inside CCK at 402 Arnold St. NE, Ste W1. Cullman Caring for Kidsʼ food pantry is low on baby foods and boxes of cereal. A larger need is a used box truck. The agency’s current box truck is in poor condition and the air conditioner has not worked for a very long time. The truck is used to pick up pallets of food from around north Alabama. The last stop on the bus tour was the Cullman County Center for the Developmentally Disabled- Margaret Jean Jones Center (CCCDD). Debra Hatley, the day program director, talked to the group and was overwhelmed with emotion when speaking of her love for the centerʼs clients. The day program volunteers with Meals on Wheels, HOPE Horses, CCK, the Cullman County Animal Shelter, St. Johnʼs Church, the Cullman library, Wallace State and other locations. One of the projects the group has is Blessing Blooms. The clients take larger leftover flower arrangements from special events, break them down into smaller arrangements, and deliver the arrangements to local nursing homes. One way to help Blessing Blooms is to donate pint canning jars. These jars are perfect for the flower arrangements. The CCCDD also operates seven group homes in Cullman County. One of the homes was nearly destroyed by this year’s hail storm. The center also sustained significant damage. The residents of the damaged home had to be relocated as their home is being repaired and refurnished. The group homes offer independence. The residents have assistance and support at all times as well activities, but they have a choice. If the activity is not something they want to do, they can stay home. The CCCDD offers a variety of programs including daycare and preschool for infants to 5 years of age, summer programs, an early intervention program and case management services. Many of the clients are working paying jobs with TQI (Top Quality Industries), which operates at the CCCDD campus. TQI does work for Wal-Mart. It receives three trucks a day of boxes that the 40-50 employees sort through, flatten, remove barcodes/ shipping labels from and return to Wal-Mart. For many adults with developmental disabilities, finding employment is extremely challenging. TQI offers them a comfortable work environment, encouragement, schedule flexibility and a real paycheck. For more information on all the United Way partner agencies, stop by the United Way at 304 First Ave. NE in Cullman or visit www.uwaycc.org. Previous articleForum: What’s needed to attract workers to Cullman County?